Good morning! This is my last DT post for Paper Jewels until April, but be sure to pop over to the Paper Jewels blog if you have time for all the beautiful creations the other team members will be posting every day! 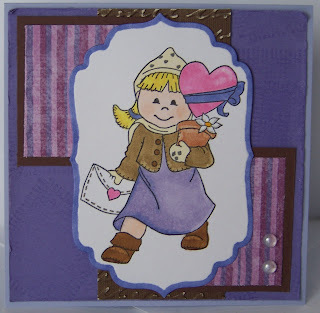 I used the sketch from Papertake Weekly Challenge Sketch #35 for this card. I also played along with the Paper Sundaes Challenge 6 to use distressing. Materials are SU cardstock in Almost Amethyst, Lovely Lilac and Chocolate Chip. I also used some misc DP from my stash. Image is Bildmalarna colored in with Copics and Bic Mark Its. I used Wonderful Weaves from SU for the background with Frost Versamark ink. The distressed script behind the image was made using my Cuttlebug Script folder and sandpaper. I also used Dew Drops and a silver Gelly Roll pen. Cute...I love the colors you used. So super cute, love it!! the image is so cute! Very cute...I love the colors. This little lady looks ready to take on the world! Awesome card! :) Your coloring looks great!